Sighting from January 17, 2019 at Año Nuevo State Park in Pescadero, CA. Each year in the winter, elephant seals come to Año Nuevo to give birth and mate. Last year I went to Año Nuevo in February, and most of the females had already given birth. There were lots of weaner pups and little interaction between mothers and pups. Read about that sighting here. This year I went on a stormy January day. It takes around one month for a pup to be weaned, so by coming in January I saw a lot more newborn pups than I’d seen on my last trip. When we arrived at the dunes with our docent led tour, we first spotted some large males resting in the grass. There were mostly younger males, identifiable because of their relatively short nose. Once we crested the dune we could see the main breeding area. It was extremely noisy, with mothers and pups vocalizing constantly. One mother near us seemed to be protecting her baby from any approaching birds. She would hiss and throw sand every time they came close to her pup. We witnessed a fight between two large males. They struck each other five or six times before the smaller one retreated back towards the water. If you look closely you can see their teeth and the bloody breastplates. Later we saw one more fight which was settled much more quickly. We also witnessed a few mating events. There were a few second and third year juveniles on the beach; our docent said they would leave before the main breeding event began. Just three weeks can make a huge difference in the kind of behavior we see out in the field! If you want to check out the elephant seals for yourself, I highly recommend the docent led tours at Año Nuevo. You can also see elephant seals on the California coastline at San Simeon or Point Reyes. On a grey and misty August morning, my family and I boarded the Radiant Queen, a fishing vessel used for wildlife tours by the guides at Skye Cruises. Skye Cruises are located in Uig on the Isle of Skye in Scotland. It’s a remote place, evidenced by the fact that there were just a few other groups on board the boat with us. We took off at a leisurely pace, hugging the coast and enjoying the glassy calm waters. We passed the sheer cliffs and local ruins. Our guides, Tom and Duncan, had lots of information about the local history and environment. They were passionate about educating us about the negative effects of local fish farms. Two new salmon farms were approved off of the Isle of Skye in spring of 2018. Locals worry that the farms will spread disease and increase chemical “medicines” in wild fish stocks. Read more about this issue here. As we headed around the corner, we spotted our first white tailed eagle soaring above the cliffs. We continued along the coastline before turning towards a small grouping of islands. On one set of rocks dozens of harbor seals. We learned from our guides that although they are common at home, the harbor seals are actually rarer in Scotland than the grey seals. They promised we would see the grey seals later. As we headed farther out towards another small island, we saw lots of bird activity on the water. There were razorbills, guillemots, terns, and northern gannets all around the area. The captain also spotted some harbor porpoises in the area. We noticed a little more splashing on the horizon and I saw some dolphins start to leap out of the water. They were common dolphins, most likely in the area for feeding. We saw some leaps out of the water and some mothers travelling with calves. Several northern gannets flew close to the boat. By this time we were close to a small island where Princess Diana liked to go to escape the pressures of royal life. The island’s other claim to fame it’s a nesting spot for puffins in the summer. Unfortunately, we were just one day too late to spot any. We did get a good sighting of an Arctic skua resting on a rock. We also saw two more golden eagles. One was a juvenile and one was an adult. We spotted a lot of jellies in the water of two species: moon jellies and red lion jellies, who really lived up to their name. Some of the red lion jellies were the size of serving platters. On our way back we stopped by another rock which was the haulout of a few grey seals. After this we turned around and made our way back to port, enjoying the crew’s stories and the tea and snacks on board! I sincerely appreciated the beautiful Radiant Queen, her knowledgeable and kind crew, and their passion for conservation. Check them out at Skye Cruises if you’re looking for unique trips in Scotland! As a naturalist, I'm always looking for ethical wildlife experiences when I travel. My first "special sighting" was in my hometown of Dana Point, California with Dana Wharf. Since then I've posted about seeing orcas in the San Juan Islands, spotting fur seals in Tasmania, and observing elephant seals and a beached blue whale along the California coastline. Last weekend I found myself again in my beloved hometown, the place that inspired my love of the ocean. I decided to go whale watching. Captain Dave's Dolphin and Whale Watching Safari is a well known local business. Anybody who spends time down at the harbor knows about "Dolphin Dave." As a local, I was stoked to be heading out for the first time on their catamaran sailboat Manute'a. The crew was led by Captain Dan and naturalist Craig. We headed north out of the harbor, noting some California sea lions on a buoy. We found our first group of dolphins near the Dana Point Headlands. The crew estimated there were about a hundred long-beaked common dolphins in the group. The dolphins exhibited feeding behaviors, surging through the water to chase the fish. Hungry birds including brown pelicans and gulls hovered and dove near the group. There were calves present in the group as well. The dolphins led us north, bow riding and wake riding. When we reached the Laguna Beach city limit, we left the dolphins and turned west towards the edge of the continental shelf, which in southern California is only a few miles offshore. We had only gone a few miles when we found another group of two hundred dolphins. The crew identified them as short-beaked common dolphins. This group also had calves, but were exhibiting more social behaviors. We saw lots of aerial exhibitions, exposed bellies, and calves porpoising with adults. We turned back south along the shelf, searching for a whale. We spotted lots of sooty shearwaters clumsily taking flight or resting on the surface of the water. After progressing south for a while, the crew spotted a spout half a mile to the southwest, followed by an enormous fluke. We approached the general area where the whale had taken its dive, then waited for it to resurface. About ten minutes later, it surfaced just over a hundred yards away from the boat. It was a blue whale. It spouted five times, slowly circling the vessel. On the fifth spout it did a fluke dive. We were perfectly positioned to capture the ventral view. According to the company's Instagram account, this whale was identified as Kinko, a female who was seen for the first time in four years. There was also another group of long-beaked common dolphins in the area, but they did not approach our vessel. There was one other boat in the area. The captain and crew had a lot of interesting information to share. I'm a Dana Point native who works on a whale watching boat and I learned interesting new facts that I'd never heard before. The operation was professional and respectful of the wildlife. At the end, we even got to taste Mrs. Captain Dave's famous brownies. You can find out more about Captain Dave at www.dolphinsafari.com. I highly reccomend following their beautiful Instagram page @captdaveswhalewatching. Elephant seals first started showing up on California beaches in the 1970s. For many years they have come to offshore islands in the winter to breed; it was the disappearance of the grizzly bear from California's coast which allowed them to finally start populating the mainland beaches as well. There's an abandoned house on an island right off of Año Nuevo State Park which is now filled with birds' nests and squatting seals. Seals are present at Año Nuevo year round, but during the winter they're there for one reason: mating. Male elephant seals arrive in December and stake out their territory - if they're alpha enough to get it. Soon the pregnant females start to show up, and in January and February they are giving birth and weaning pups. This means that there are lots of mating displays, including fights between alpha and beta males. At this time of year, you have to book a docent-led tour to see the elephant seals. Spots are highly coveted, so we booked ours in December to go to Año Nuevo the second weekend of February. Our docent Sue had been leading tours for over twenty years. She gave us lots of information about the animals and led our tour group through dunes scattered with male elephant seals resting in the middle of the trail. She informed us that two weeks previous to our visit the dunes were full of males. We only spotted a couple. Males are easily identifiable by their massive size and prominent proboscis. Once we got to the beach, however, it was a different story. We crested a tall dune and were greeted by the sight of hundreds of elephant seals grunting and cackling. Their sounds are very unique - Sue described the sound of the male as something like a motorcycle in a gymnasium, and the female sound as something like a mix between a burp and a fart. Because it was a colder day with winds blowing at 30 knots, the seals were more active than they would be normally. Near the foot of the dune we stood on were about a dozen fat, shiny pups. These were the "weaners." The weaners are the pups that have already been nursed and weaned by their mothers. The whole process takes less than a month because the mothers' breast milk is so rich. Closer to the water the females lay, some with pups that were still nursing. Every once in a while a male would approach from the side of the group, attempting to sneak up on a female. When she noticed him, she would widen her mouth and call loudly to the alpha male to chase away the beta male. Often, all the alpha male had to do was raise his head to send the beta scurrying away. When it wasn't enough, the alpha charged towards the beta, occasionally rearing up and striking at each other. Sue recommended coming to the park on windy, rainy, cold days. She said that's when there's the most activity and the fewest number of other visitors. Find out more and plan your visit to Año Nuevo here. My friends and I made a weekend out of it, staying in the youth hostel at Pigeon Point Lighthouse. They also have a great cliffside hot tub. We soaked at sunset and saw gray whales spouting off in the distance while harbor seals lounged on the rocks below. From the beaches the next morning we were able to spot more harbor seals and a group of dolphins. My sister Helen and I both enjoy wildlife related activities, so when we got to Tasmania we sought out responsible eco-tours in the area. I stumbled upon Wild Ocean Tasmania, a small company owned by Damo and Suzy. They run the business out of a shipping container in their backyard and use a small 12-person pontoon boat to explore the Tasmanian coastline. Their focus on adventure and education sounded perfect to us. We arrived at Eaglehawk Neck around 9:00 a.m. and were supplied with cozy dry suits before Suzy drove us down to the marina. Damo was already there and loaded us on the boat. They warned that swells had been large the previous day and rain was in the forecast. Helen and I had explored the area on foot the previous day and had encountered some snow at the tip of Cape Huay. We set off to explore some of the rock formations of the Tasman peninsula. With a small, maneuverable vessel, we could duck into caves and around towering dolerite monuments. Damo explained that these columns were part of a single 4000-kilometer-long formation which extends from Australia all the way to Antarctica. The formations are the result of volcanic activity, most likely formed during the Jurassic Period. We slowly made our way along the coast towards the cape. I had my eye out for albatross, and as we came around a corner I got my first glimpse of one. I pointed it out, and Damo confirmed that we were looking at a shy albatross, which can grow to have wingspans of over 8 feet. He also told us that of the 22 species of albatross currently in existence, only 3 are expected to survive the next decade. Plastic pollution is one of the biggest problems facing these magnificent creatures. Over the course of the trip, we would see at least a dozen more. We also noted some black faced cormorants resting on the rocks. In the air we spotted crested terns, silver gulls, a sea eagle and an Australasian gannet. We made our way around the Totem pole, a magnificent dolerite column at the tip of Cape Huay. The Totem Pole stands almost 1,000 feet high. The rock shot straight up in the air for hundreds of feet. A few Australian fur seals lounged on the rocks near the base. We headed off in the direction of Cape Pillar, which Damo and Suzy thought would be the best spot to see fur seals. On our way over we noticed a huge swarm of dark brown birds. They were short-tailed shearwaters. These amazing birds travel thousands of miles to all mate on a single night on the cliffs of the Tasmanian peninsula. They soon engulfed us as they dove for krill. After watching the shearwaters for a while, we headed into some of the fur seal spots. The swell was large, but we decided to attempt to take a look in the water. Fur seals in the water with the shearwaters. Damo and Suzy have engineered a unique platform which allows snorkelers to lie still. That way Suzy could use a small, very quiet motor to drag four people at a time through the water with minimal kicking and splashing so as not to disturb the seals. The water was very cold on our faces, but our bodies were nice and cozy inside the dry suits. We entered the water 200 yards from the nearest seals; then Suzy quietly drove us away from the boat and we waited to see if we would be approached. The plant life on the sea floor was beautiful. The kelp swayed in time with the swell, and we saw krill and semaphores drift by. One male Australian fur seal swam up to us, but only stayed for a few seconds before zooming underneath us and out of sight. Due to the large swell, Suzy decided to pull us out of the water. We climbed back on board and drank some hot tea while watching the fur seals on shore and in the water. On our way back a group of common dolphins began to bowride off the vessel. Damo slowed to accommodate them. They were engaging in playful behavior in our wake. I was able to see some social behaviors happening underwater as well, including lots of touching and swimming upside-down. The dolphins stayed with us for a few minutes before we headed back towards Cape Huay. We heard reports of a leopard seal that had just eaten a cormorant near there, but we were unable to locate it. Our journey back was filled with more wonderful albatross sightings as we enjoyed the beautiful sunny weather and turquoise water. Upon our return to their property, Susie showed us the baby wallabies she rescues. Many of their mothers are hit by cars. She feeds them by hand until they are big enough to be released back into the wild on their property. She told us that now the wallabies she rescued are showing up with their own joeys. We rewarded our successful trip with coffee and a picnic overlooking Eaglehawk Neck. I will certainly be back to experience the wildlife of Tasmania again. I highly recommend touring with Susie and Damo for an unforgettable, eco-conscious experience. 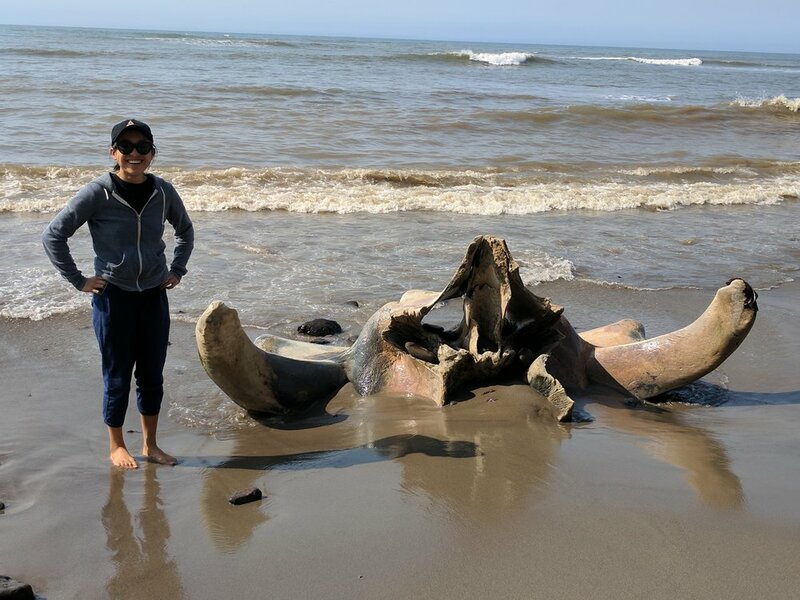 In May, a 79 foot blue whale washed up on Agate Beach in Bolinas. The Marine Mammal Center performed the necropsy and concluded that the whale had suffered trauma to her skull, a fractured spine, and broken ribs, suggesting that she was hit by a container ship. Even though parts of the body have decayed or been collected by researchers, some of the whale is still on Agate Beach. There is a large amount of skin, including the pleated grooves on the throat. There are a few bones, most notably a single vertebra. We also found baleen. There are around 2800 blue whales who feed near our continental shelf in the summer. They are endangered, and as such it is illegal to take any part of their body. It is also illegal to harass or disturb a beached whale, whether it is alive or not. It is always important to be respectful of the creatures. Ship strikes are a huge problem for whales near San Francisco. The San Francisco shipping lane is one of the top two deadliest spots on the west coast for whales. We journeyed on to Point Reyes for the afternoon, where we spotted some intertidal creatures, birds, and tule elk. A huge thank you to friends Goni and Caroline for contributing photos and being ready for adventure! 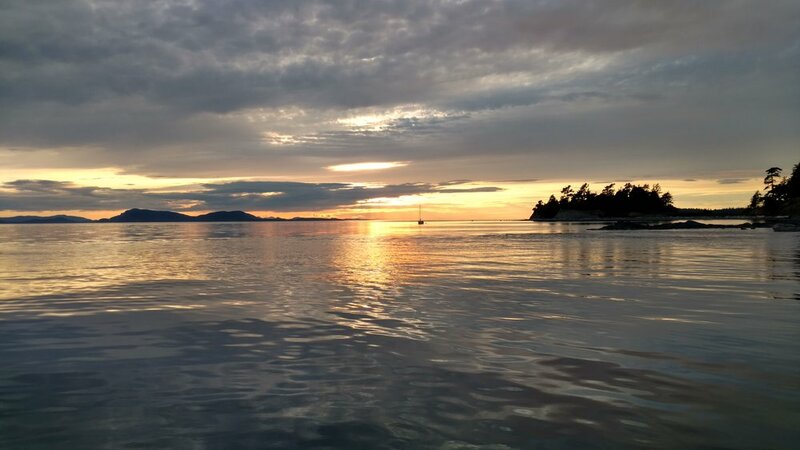 R/V Zephyr at sunset on Sucia Island. I spent a few days in July with my family in the San Juan Islands. We sailed on the R/V Zephyr with Captain Ron and Captain Ashley, who knew that I was particularly interested in seeing wildlife. I was particularly interested in seeing orcas - I had never seen them in the wild before. Zephyr was at one point a San Francisco pilot boat and was later converted to a research vessel. Perfect conditions on the east side of Orcas Island. We hadn't been on board for more than twenty minutes when the first spouts were spotted about a mile away by Peapod Rocks (48.639684, -122.752462). As we slowly approached, we could make out the distinctive dorsal fins of orcas. I counted six spouts in total. Harbor seal checking us out. There were five or six whale watching vessels nearby, as well as a small patrol boat making sure everyone followed the restrictions. We slowed down and stayed outside of the whale watching vessels, always at least 300 yards away. There was no wind at all, and the sea was like glass - absolutely perfect conditions. A harbor seal bobbed along side us for a few minutes before disappearing beneath the surface. We watched the orcas from a distance with the boat in neutral for about 20 minutes before many of the observing boats began to leave. The whales eventually disappeared from our sight, and we continued on around the eastern tip of Orcas Island, where we sighted them again at the cliffs of Lawrence Point. There was only one other boat besides us, and both of us moved slowly to avoid disturbing the whales. At one point as we floated in neutral, the group came within 50 feet of our bow, allowing us to see clearly that there were two calves in the group. The whales moved past us and gave the other sailboat nearby a close encounter as well before moving on Clark and Barnes Islands, where they hunted in the shallow bays. Hunting in the shallow bays. Ashley informed me that these orcas were identified as transients T37 and daughter T37B with her grandoffspring, along with the T34s. We eventually left the orcas and continued on to Sucia Island (48.760951, -122.900890), where we anchored for the night. Around sunset we went on a short kayaking expedition and discovered a multitude of harbor seals with their pups and even spotted a family of river otters. We saw pigeon guillemots, black oystercatchers, cormorants, gulls, herons, murres, and surf scoters. My mom, who opted for an expedition on Vortex instead of kayaking, was lucky enough to spot some bald eagles. The glassy water under us was a galaxy of moon jellies, fish, and purple sea stars. A beautiful ending to a very exciting day! Huge thanks to Captains Ron and Ashley for their expertise. I especially appreciated their respect for the wildlife and knowledge of the San Juan Islands. They also took all of the photos of us on this post! You can find them on Facebook if you want to know more about what they do. Looking forward to being back on board Zephyr soon! My hometown is the beautiful city of Dana Point, California. In May and June, Dana Point and the rest of Southern California were getting quite a bit of press for sightings of juvenile great white sharks. On a weekend at home, our family went shark searching with Dana Wharf Whale Watching. Although my sister and father insisted they saw a shark breach, the guides didn't spot anything that trip and gave us passes to come back whale watching instead. We returned two days later for a 10am whale watching trip, the first of the day. 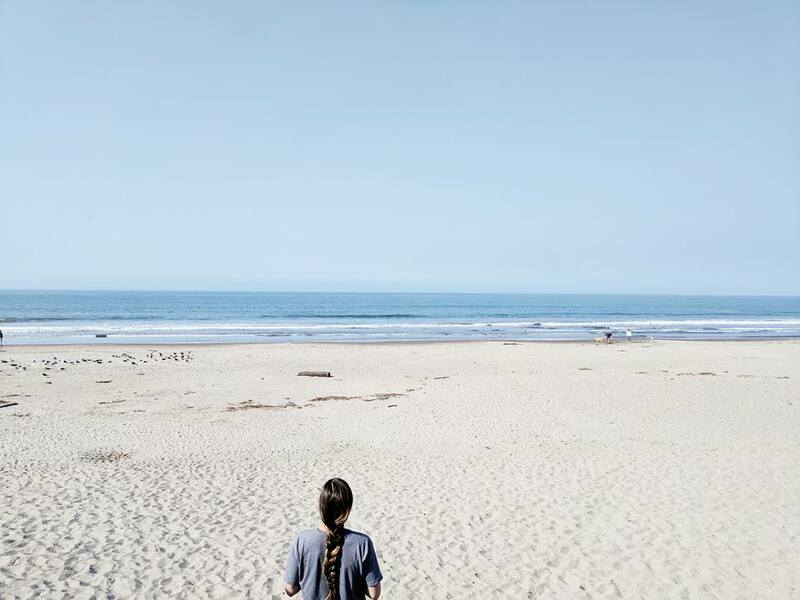 I had not been whale watching in Dana Point since I was very little, and I found myself comparing the experience to being out on the windswept sea in San Francisco. The water for this trip was flat and there was very little wind, but the same coastal fog kept the sun at bay. California sea lions rest on a buoy. We spotted some spouts from a mile off, a few miles west of the Headlands. They looked like humpback spouts to me; as we approached my suspicions were confirmed. We had a total of four humpbacks within 500 yards. A few other boats were watching the same whale, most of which had come from Long Beach or LA. The whales appeared to be feeding, and there was a good amount of bird activity. After a few minutes, we also noticed common dolphins feeding with the whales, and within a few minutes they were checking out our boat. The guides mentioned that these whales were probably opportunistically feeding on their way up to the Farallon Islands; I wondered if I would see the same individuals in a few weeks. We watched the humpbacks do several fluke dives and one breach which I barely caught on camera, then turned around to head home. As we headed out, I noticed a Minke whale surface once 200 yards from our boat before disappearing. I watched our stern, hoping to catch another glimpse, but it was gone. I submitted my fluke photos to Happy Whale, which can help whale researchers identify and track individual whales over time. They informed me that one of the individuals I saw is named Chief. Check out the map of where this whale been swimming since I last saw it. You can submit your own fluke photos at happywhale.com!